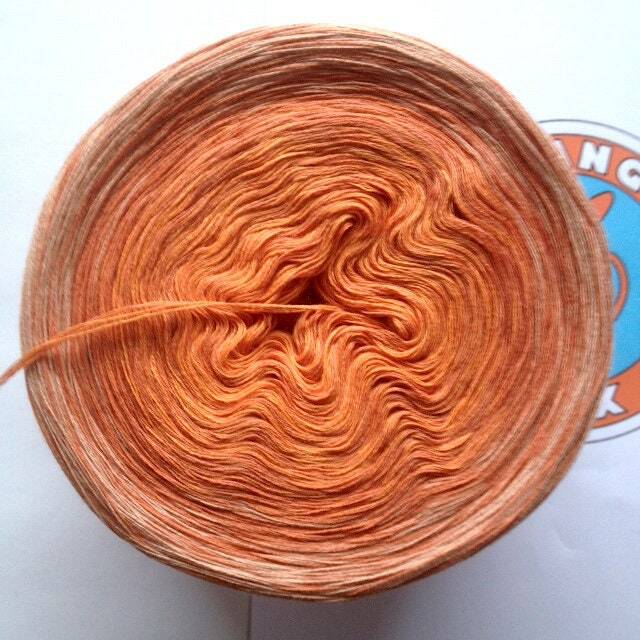 About 218g/900 m wrapped, folded Gradient yarn "Pumpkin Pie" made of 85% Cotton (long-stacked Egyptian mako cotton/15% Cashmere. 352g/1200 m 100% baby Alpaca "Intergalactic"
272G/900 m merino extra fine "goldfish Pond"
145g/600 m Mako-BAUMW./Kaschmir "Storage City"
286g/1200 m Mako-BW./Kaschmir "Princeton Magnolia"
161G/600 m 60% Äg. BAUMW./40Leinen "Beach Shell"
223g/900 m Giza-bw.-Jeansgarn "Denim Skies"
186g/600 m 100% Merino extra fine "chalk rocks"